High-pressure steam is used in a steam engine for greater efficiency and less space per horsepower. Now with the use of this high-pressure the range of expansion is correspondingly increased. If full expansion takes place in the single cylinder the walls of the cylinder to be made very thick. This way engine withstands the high pressure but also required a heavy flywheel. All this made a simple engine very heavy in construction, large variations of temperature and more leakage past the piston. These are some basic engineering difficulties mostly observed while designing the machine. To overcome these difficulties, the expansion of steam is made in two or more cylinder. This called “Compounding the expansion of steam”. In this type, the cylinders are arranged on a common axis and two pistons have a common piston rod, connecting rod and crankshaft. The exhaust steam from high-pressure cylinder passes directly into a low-pressure cylinder where it further expands. The turning moment in this type of engine is not uniform due to common crank and piston rod. Because all the torque acts at the same time. 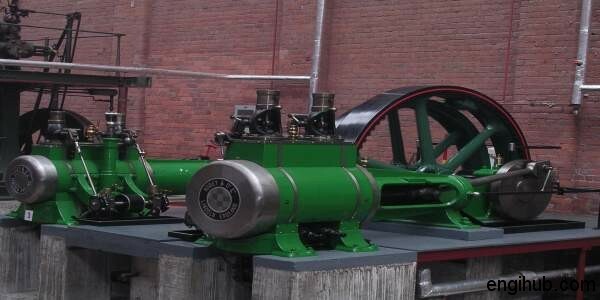 This is the basic disadvantage of such type of engines and requires a large flywheel. Tandem arrangement gives the constructional economy because of fewer components of the engine. In this type, two cylinders are arranged side by side. While the two cranks are placed at 180degreese to each other. The pistons of high pressure and low-pressure cylinders begin and end their strokes together respectively. The exhaust of steam from high-pressure cylinder coincides with the suction in a low-pressure cylinder. In this case, also exhaust steam from high-pressure cylinder passes directly into a low-pressure cylinder where it further expands. Since the two cranks are at 180 degrees to each other, the two cycles are in phase. But this causes large variation in the turning moment of the crankshaft and necessitating the use of a heavy flywheel. In this type, two cranks are mounted at 90 degrees to each other. Hence steam from the high-pressure cylinder cannot exhaust directly into the low-pressure cylinder. A container, known as a receiver is used to collect steam from the high-pressure cylinder. This low-pressure cylinder draws steam from the receiver for further expansion. The turning moment in receiver type compounding is more uniform therefore a lighter flywheel can be used. With the three-cylinder engine, the cranks are arranged at 120 degrees to each other but still, small turning moment variation can be achieved.